It's been a while since I've written here. So what has prompted this missive? News that the USDA's Animal & Plant Inspection Service (APHIS) is proposing changes in regulations about license requirements for pet breeders. So far, we have been exempt from Federal licensing and inspections since we sell all our puppies directly to the lifetime families who will care for the dogs. The change in the regulation will require us to be subject to the Federal licensing and associated USDA inspections because not ALL of our buyers visit our farm and view the dogs, puppies and facilities first hand. A pet store will still be exempt because the buyer visits the store and picks out their pet on site . . . even though the puppies were not bred or raised at the store and the parents and other relatives aren't available there for inspection. But because many of the families that choose a Rosehall pup never get to visit the farm but chose their pup at great length through internet research and checking out kennel reputations and breeding lines, etc. we could end up under the excessive burden of Federal Government Regulation. Now, don't get me wrong . . . I'm as concerned (or more so) than anyone over the proper care and health of dogs and puppies in homes and in kennels. I'm as offended (or more so) over the cruel conditions that some dogs suffer in the 'puppy mill' kennel facilities. I don't for a minute think that somehow I should be able to get away with anything less than great care and attention to our dogs. 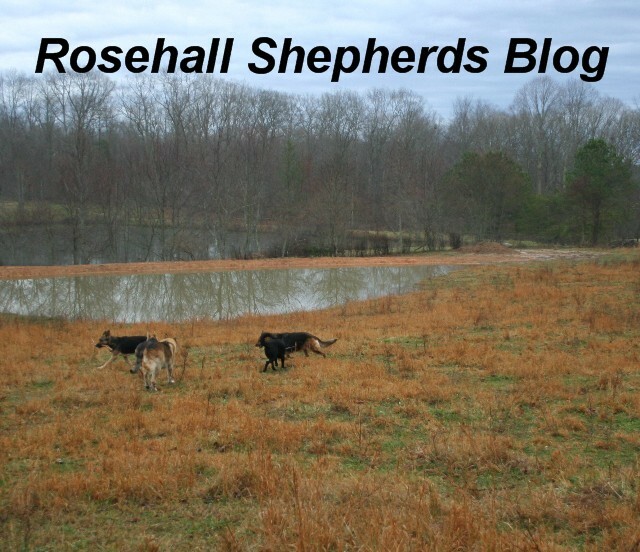 But, after reading the Federal Animal Welfare Act regulations, I do not believe that the minimum conditions of their regulations live up to the high level of care and facilities that we maintain here at Rosehall Kennel. In other words . . . we wouldn't have trouble living up to the standards set by the Federal Regulations . . . BUT the burdens of record keeping, identification, inspections, etc. would be excessive for us and quite possibly cause us to consider ending our work with these fine dogs. OR . . . we would have to add staff to manage the administrative requirements of the licensing requiring us to significantly increase the cost of the puppies and quite possibly having the same result . . . that we would have to close the kennel, being 'priced out of business.' We are already inspected by American Kennel Club because we chose to register all our dogs with them. Our ultimate inspectors are our puppy buyers . . . even the ones who never visit the farm have 'inspected' us before choosing to purchase their pup from us! Consider this interesting statistic from the USDA's AWA web page: The AVERAGE size kennel inspected by USDA in 2010 had 106 adults and 93 puppies on site at the time of the inspection! I found that shocking . . . AVERAGE of ONE HUNDRED AND SIX adult dogs. Now just because an operation is large doesn't mean that it doesn't have safe and clean conditions. Just because a kennel is small doesn't mean that it is doing a good job either. My problem with the existing regulations and the proposed changes is that a 'one size fits all' approach isn't a good way to approach the risks and problems of bad animal care or kennel management. I wouldn't mind additional inspections of our work . . . (well I would mind it . . . it's a terrible inconvenience and takes us away from the daily care of our dogs . . . but I would tolerate it). I wouldn't necessarily object to having a federal license and paying the fees (as long as they aren't prohibitive!) I do know that the degree of regulation specified in the countless pages of their document are not necessary for a kennel of our size and nature and would in fact cause us to have LESS time to give to the animals in our care. THERE IS A WAY THAT YOU CAN HELP . . . The American Kennel Club (AKC) has taken a stand AGAINST the proposed regulation changes and has a petition that you can sign to voice your concern about the uninteded consequences of them. Click on this link to sign the petition and help us keep governement regulations effective . . .
Eliot & the Rosehall Dogs. 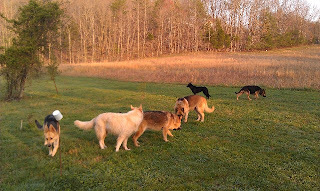 We are careful breeders of large, A.K.C., straight backed, family friendly, calm temperament, German Shepherd puppies for sale.